It's important for the very young to have books read to them, and to have books of their own to read, play with, and yes, chew. If you're looking for a book for a young child or baby, or you need a book about a baby, you've come to the right place. From my review: "How I Love You would be an inspired choice for anyone who is looking for a children’s picture book gift for a baby shower, or for a little one who needs a gentle, calming and reassuring story for bedtime." Another Ormerod classic! Here's my review. From my review: “This children's picture book has all the ingredients needed to become a classic. It has a refrain kids will love to repeat: 'We love it, we love it!' said Bonnie and Ben. 'How does it go? Will you say it again?' It has loved rhymes children will delight in recognising and chanting. It has the most delightful illustrations. And it also has a wonderful male role model in Skinny Doug, a babysitter who knows exactly what children need to hear at bed time." From the publisher: Baby Beats is a good way to introduce young children to different types of noises, musical instruments and group play. Let's play music, make a beat. Clap your hands and stamp your feet. Not a book about babies or for babies, this one is more for when they’re toddlers. But it’s strong rhythms and possibilities for action make it a must-buy for young parents who want their kids to enjoy reading. My review. From the publisher: Animals excitedly discuss seeing, tickling, singing with and feeding the baby. Mother Duck says she not only kissed the baby, she is about to do it again. And she does. Making the baby burst into a chorus of "Quackie! Quackie! Quackie!” My review. This is a picture book about a baby chicken but it’s not one to get kids to fall asleep. Instead, it will have them laughing aloud at the antics of someone who knows all the tricks of interrupting bedtime stories and staying wide awake! It would make a great gift for a baby you just know is going to have a fine sense of humour. My review. From the publisher: Sturdy board books with beautiful colour images, engaging questions and clear labels. 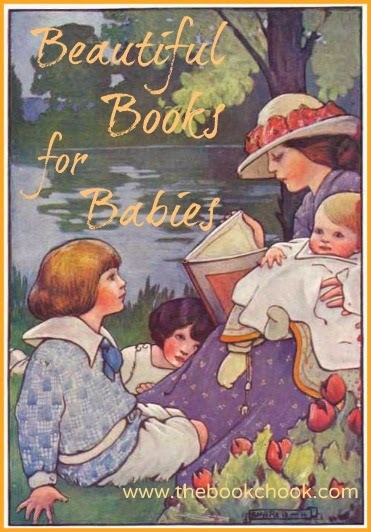 A great series of books to share with your baby. Another beautiful book for babies, by Mem Fox and Emma Quay. Anastasia Gonis’ review on Buzz Words. Hello Baby! by Mem Fox. Recommended by TL Kerry Neary, here is Mary Ann Scheuer's review. Ten Little Fingers and Ten Little Toes is yet another wonderful Mem Fox book for babies. I wrote about it in Bedtime Goes Better with Books. Written by Kenn Nesbitt and illustrated by Rebecca Elliott, this Scholastic Inc children's picture book from 2013 has a puffy cover and wipe-cleanable pages. Text about little animals falling asleep is calculated to put babes into the same frame of mind. RRP $10.99. Baby Bilby, where do you sleep? Your Mother Didn't Do That! If you're unsure about the kinds of books you should choose for babies, Jackie Small of My Little Bookcase has a run down in How to Choose Book Gifts for Babies. Find more Children's Book Reviews on The Book Chook by clicking Reviews in the right sidebar. You might also like to read The Book Chook's Top Ten Picture Books.